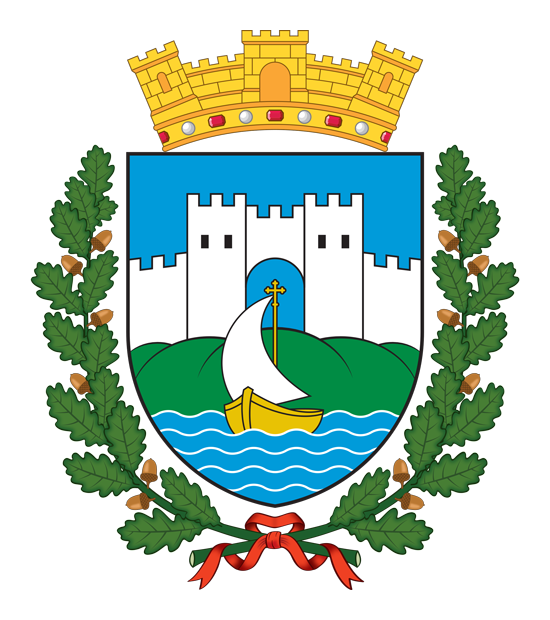 The symbols used for the blazon and emblazon of the coat of arms are based on previously existing emblem of the municipality. It is primarily due to the historical significance of the emblem as one of the oldest municipal coats of arms in Macedonia. It dates from the 1950s, and is registered in the register of local emblems in the United Nations as an official municipal emblem in 1967, which is quite rare for a Macedonian municipal coat of arms. The oak is unambiguous and unmistakable Macedonian symbol. An entire species of the genus Oak is named Quercus macedonica (Macedonian oak). It should be noted that the ancient rulers decorated themselves with garlands made ​​of golden oak leaves, despite Greek examples of olive, palm or bay garlands. This is irrefutably witnessed in the findings in the tomb of Philip II. The fact that Ohrid is one of the several Macedonian cities that constantly live from its foundation and until this day, and is also the town where ancient artifacts are abundant, only supports the above standpoint. The capital of the Macedonian spirit deserves clean and irrefutable Macedonian symbol as the oak.